Preheat the oven to 220 °C. Mix all the ingredients together in a stand mixer with dough hook attachment. Add extra flour if necessary, but the dough should be quite wet and sticky. When the dough comes together, knead for 2–3 minutes on a lightly floured surface. Take a golf ball-sized piece of dough and roll out as thinly as possible with a floured rolling pin, again on a lightly floured surface. For these flatbreads I like to make them loosely rectangular in shape. Bake on a lightly greased baking tray for 8–10 minutes, or until golden. Alternatively, cook in a hot griddle pan until golden and cooked through. For the dukkah, lightly toast all of the ingredients in a dry pan over a gentle heat. Be careful not to let anything burn. When the nuts and sesame seeds are golden and fragrant, remove the pan from the heat and set aside to cool completely. Store in an airtight container. 5. For the dressing, stir all the ingredients together and adjust to taste. For the topping, fry the chicken and spices in the olive oil until golden and fragrant. 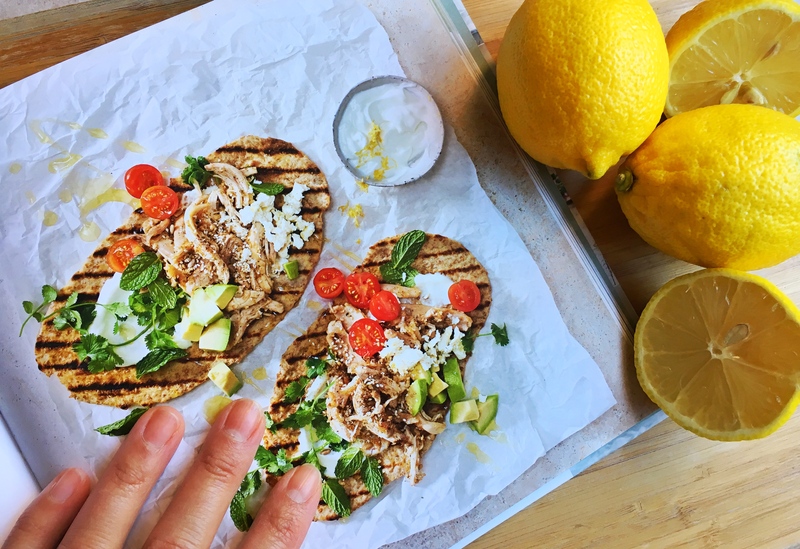 Spread some of the yoghurt dressing onto the cooked flatbreads, then top with the chicken, a generous sprinkling of your dukkah spice mix, crumbled feta, red onion slices, baby tomatoes, avocado (if using), and fresh herbs. Serve immediately with lemon wedges and extra dukkah on the side. Recipe from Sarah Graham’s book – ‘Wholesome’.